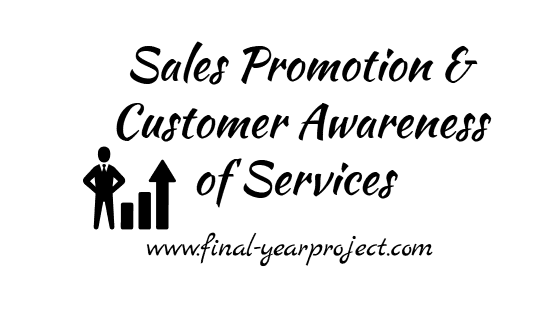 This is a good MBA project report on "Sales promotion and customer awareness of the services at Standard Chartered Finance Ltd." and submitted in partial fulfillment of Master of business administration course for marketing students. Standard Charted Bank has been established for over 150 years and is used for the study. The report is divided into many chapters and start with introduction of the company and its history. You can also Subscribe to FINAL YEAR PROJECT'S by Email for more such projects and seminar. The objective of the study is to create market awareness, to know about decision makers, to analyse the market potential of the product mileage, to judge the level of awareness for product Mileage, to check the satisfaction level of existing customers, to know about customer preference and to identify the criterion on the basis of which customer selects a particular bank. The project was to check feasibility of the services offered by Standard Chartered using both primary and secondary data. The primary data was obtained through observation, direct communication with the people and filling up of questionnaires, also enormous help was obtained from Standard Chartered, branch seniors and colleagues working there. The main aim of this project visits was to identify the potential customers or the potential market. A two-way discussion was done which the customers were made aware of the services of Standard Chartered. The questionnaires are either directly filled up or indirectly filed up by the people and through this the prospect of the areas where these campaigns were put up. Use this report for your reference and study work only.